Port-wine stain is the kind of pigmentation defect in which some reddish-purple discolourations appear on the skin as a result of some swollen red blood vessels in the body. It is believed that this type of pigmentation occurs in about 3-4 out of every 1,000 people, and it may be a sign of some other forms of diseases such as the “Sturge-Weber syndrome”. At their onset, port-wine stains often appear as flat and pink pigmentation stains on the skin, however as the child grows, the colour of the stains will gradually turn to dark red or purple. These changes in colour will continue to get darker as the child continues to grow with the stains without any treatment. Port-wine pigmentation can occur anywhere on the body but they are often prominent on the face of the child. The physical examination of the affected skin region is performed by the dermatologist to ascertain if the skin disorder is actually port-wine stain, this physical examination may be followed by skin biopsy to confirm the disorder. In some cases, the doctor will have to consider performing a intraocular pressure test of an X-ray test on the particular region of the skull , these tests will depend on some other form of symptoms that are visible and the location of the port-wine stain. There are several options available in the treatment of pigmentation stains and most prominent among these including; Freezing, radiation, Laser therapy ,tattooing, and surgery. Laser surgery seems to be the most successful of all but it also remain one of the most expensive ways of dealing with the skin disorder. 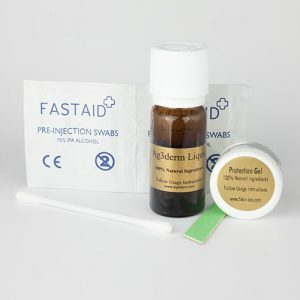 It is also a complicate treatment method because the kind of laser used will depend on the age of the patient as well as the kind of the symptoms of the port-wine stains. It is important to note that older port-wine stains respond to less effectively to treatments than fresh ones. Likewise stains that appear on the face will respond to treatment better than those that appear in some other regions such as leg and the middle region of the body. It is very important to treat port-wine stain because they may develop into Glaucoma infections later in the future. Untreated port-wine stain often result in permanent disfigurement and some other skin complications which may prove very difficult to treat later. An health care provider will be in the best position to recommend the best possible treatment for a Port-wine stain.